On a recent Friday at noon Cosmos sat on a milk crate in front of Red Wing Shoes on Queens Boulevard. 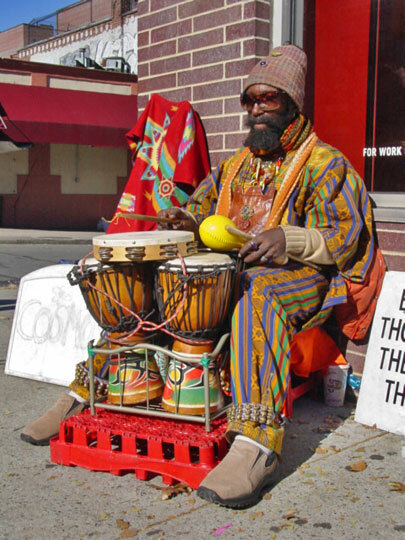 Dressed in colorful African garments, he alternated between drums, maracas, the flute and tambourines, creating what he calls “the melting pot sound,” improvisational music inspired by New York’s myriad cultures and street sounds.“Everything is music to me,” he tells me. “The birds, the pace of people’s feet. There’s a certain rhythm pattern in the cars coming to a stop. They sound like the ocean at the seashore.”Cosmos attributes his love of music to the fact that his mom played the mandolin while she was pregnant with him. Born to a family of West Indian immigrants, music permeated every moment of his childhood. Each birthday he would get a new instrument, and home was where he could make music, rather than the physical structure over his head. “I have an interesting idea of territory,” Cosmos says when asked where he lives. “Words like homeless I do not understand. Home is where your heart is.” And in his heart, he says, he feels a strong connection to Sunnyside, where he has played for 25 years. He suspects “a magnetic current running through Sunnyside that has everybody aligned.” In Sunnyside no one has ever told him to leave. Some people stop just to listen, others to give him a couple of dollars or to tell him that they will be out of town for the weekend but back in touch when they return. “Every soul is a valuable asset,” Cosmos says. He avoids “the industries” and rarely records what he plays. He prefers to play in front of a live audience. He tells me that playing for patients at the psychiatric institution on Ward’s Island, where he once worked in food services, led them to open up in ways words alone could never accomplish. When he gets tired of playing, Cosmos takes a short nap or juggles clear plastic bags adorned with rainbow-colored ribbons, an exercise he invented to enhance his endurance and coordination. His Indian ankle bells jingle as he jumps up to catch the bags in the wind.